I first started working on camera traps a very long time ago, and with not much success. I remember using an old Kodak Retina 1b camera. I tied a piece of cotton to the shutter lever and ran it across an animal track and, I took a picture of a wombat! Things have improved a good deal since those days and now, it’s not all that hard to build a system using a good quality. There are a number of resources on the internet, and some of those are forums where one can ask questions and read what others have done. Having read a lot of posts on these sites, the thought that comes to mind, is that many people make it harder than it needs to be. Admittedly, many people spend a good deal of time trying to adapt items that they already have, and others want to push the boundaries and try new gear that might offer some advantages. My approach is to go with tried and proven equipment to develop a reliable system, and then the boundaries that I want to push are more technique and subject matter boundaries. One of the most appealing aspects of camera traps to me is that it offers a new perspective – often wide angle and low vantage point. I would suggest that you go to the trouble of buying the components that are known to be reliable and easy to set up in these systems. If you do that, then you minimize the technical problems and are likely to have a less stressful time in building your system. 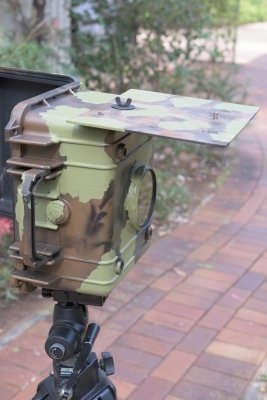 I have described below, the camera trap that I use. I think it’s a reasonable approach (obviously not the only approach!) and it does require a little technical expertise but it’s not particularly difficult. My system uses a Nikon camera body in a waterproof housing. It has a battery grip on the base for added longevity in the field. 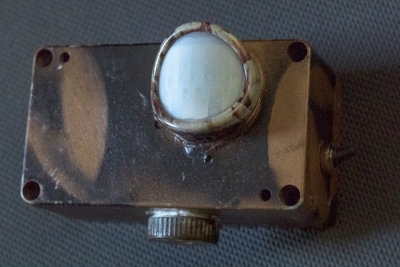 A passive infrared sensor is housed separately and hardwired to the camera. I have three flashes that activate when the PIR detects movement and then sync with the camera for the photo. The flashes run wirelessly. I use the Nikon D810, however almost any SLR camera would be fine for a trap. It needs a port to accept a remote shutter release and a hot shoe for a flash. Because my camera is rather large (with a battery grip included) I have used a Pelican 1300 case as an enclosure. This gives me enough room to put the wireless remote flash trigger on the hot shoe and to turn the auto-focus on and off on the camera body. I have cut a 82 mm hole in the front of the box and installed a glass filter so that the box is entirely waterproof (more on that subject later). The triggering device is a passive infrared sensor and board called an SSII Controller Board, provided by Gary Kohout at Snapshot Sniper. There is a good deal of information on Gary’s website about this board and one of the best features is that it is controlled by a programmable chip called an Picaxe 08M2. The chip comes with a programme already included and it will do the job, if you don’t want to program it yourself. It is, however worth taking the time to create your own programmes. All the information that you need for this chip is here, as well as the various components that you need to buy, and the program that you need to run to download a new script to the chip. It’s all very inexpensive and quite an easy process to master. I didn’t know much about programming, but I started off with a script that Gary sent me and built upon that. What can you do with programming? Well, the programme takes effect from the moment that the sensor detects movement, so you can turn the camera on (1/2 press / focus) and add a delay before the camera fires so that the flashes have time to charge up. You can determine the number of photos the camera will take each time the sensor is triggered, and you can determine the length of the exposure (if the camera is set to a “B” setting, perhaps). To download the programming editor. to refer to the list if PICAXE basic commands. You will only use a few of these commands, so look at the program that Gary has sent and check to see what commands he has used and what they mean. A number of different types of flashes are used in traps, each with its own varying degree of success, but the one that really stands out is the Nikon Speedlight SB28. This flash has a wonderful standby mode that is amazingly economical on battery life. Since the production of that model, most of the subsequent Nikon flashes have the same or a similar standby mode are also good. It is worth investing some money in these flashes because it makes life so much easier! They can operate for several weeks just on a standard set of batteries. You can get them on ebay for quite a low price. If you are in Australia, look at the US Ebay site and not the .au site. For some reason, Australians appear to place unrealistic prices on these flashes! They are quite an old model and they don’t so TTL with modern Nikon cameras, but that’s ok because in a camera trap, I use them on a manual setting. Like the camera body, I put the flashes and their wifi slaves in a water proof enclosure. I use the Yongnuo RF603N II slave, after having tried a number of different brands and searching through the Camtrapper forum to see what other people thought. These RF603’s work very consistently. I haven’t tested all components to see how long they actually last on standard batteries. I tend to leave my systems out for a maximum of seven days and then I move to a new location. Over that period, the camera and the flashes cope quite well, but the RF 603’s appear to have only about a 2.5 day life on their standard batteries when in the receive mode. I have thus added extra power to these. I have soldered a positive and negative wire to the base of the battery terminals in the unit and then put them into a little plug on the side of the unit. Into this I can connect any type of extra power supply, providing it only supplies 3 volts. My solution has been to use Ultrafire SJ 18650 rechargeable batteries that run at 3.7 volts and supply 6000 mAh. The voltage is a little high, so I run the voltage through a two small diodes in series to drop the voltage to about 3.2 V.
Finally, don’t underestimate the critical importance of waterproofing everything! If you don’t do this, batteries will drain overnight. Humidity is a real killer, even when you think conditions are ok! I put silica gel in all of my enclosures as a standard practice. I place the camera in position and then put a ‘subject’ in the position where the animal will be, and focus on it (a rock or a backpack etc.). After focusing on it, (and the camera is solidly mounted) I turn the AF off. I set the flashes up and measure the light output with a flash meter, then set the camera's aperture accordingly. Very simple really!!! Not sure that I even need to explain that part!!! 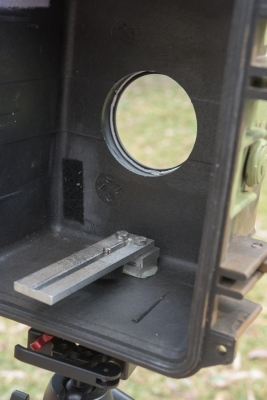 The best place to find a complete description of a trail camera build is on the Camtrapper forum “ Everything DSLR Related” under the pinned posts from TRLcam “ Economy DSLR camera trap build Parts 1-4. Inside the Pelican case. A hole cut for the glass filter and a bracket to fix the camera to. The case from the outside with 'awning' to help keep water off the glass filter. Note the camo job which I am sure, does not fool any animal! The Nikon SB28 in an aluminium box with perspex window. 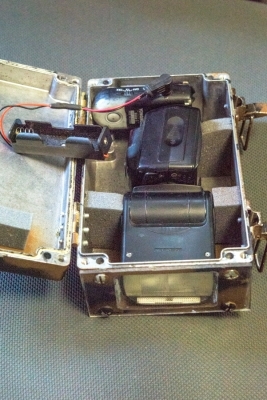 The flash slave is connected and the battery holder attached, takes a 3.7V Ultrafire 6Ah battery for the slave. 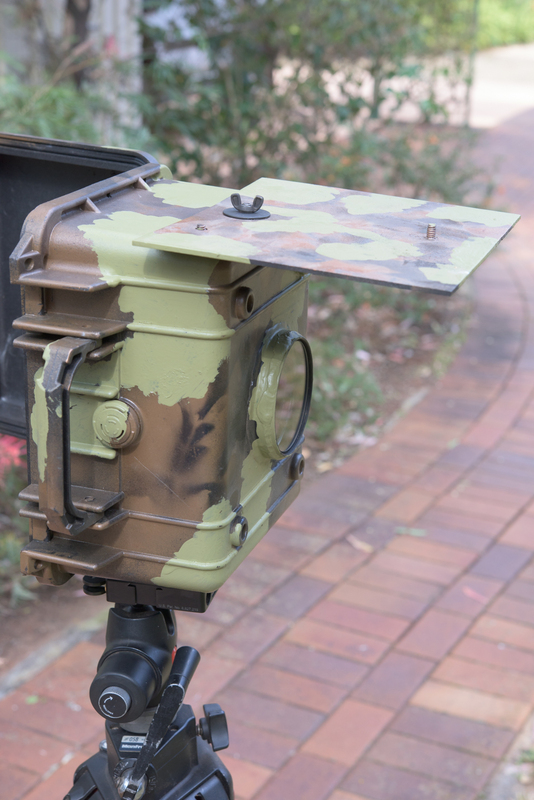 The Snapshot Sniper SSII in a plastic box.